, an eminent oriental and classical scholar, was born at Utrecht, April 26, 1624, of reputable parents, who died when he was very young. He studied at the schools and university of Utrecht, and took his degree of master of arts in 1647. To his philosophical course, he then added the study of theology, and particularly the oriental languages, in which he made great proficiency. In 1649, he was admitted among the number of candidates for the ministry, and then went to Amsterdam to acquire a more perfect knowledge of the Hebrew, and of the Jewish customs, availing himself of the instructions of two learned Jews, one of whom, being an Arabian, gave him a favourable opportunity of adding that language to his stock. 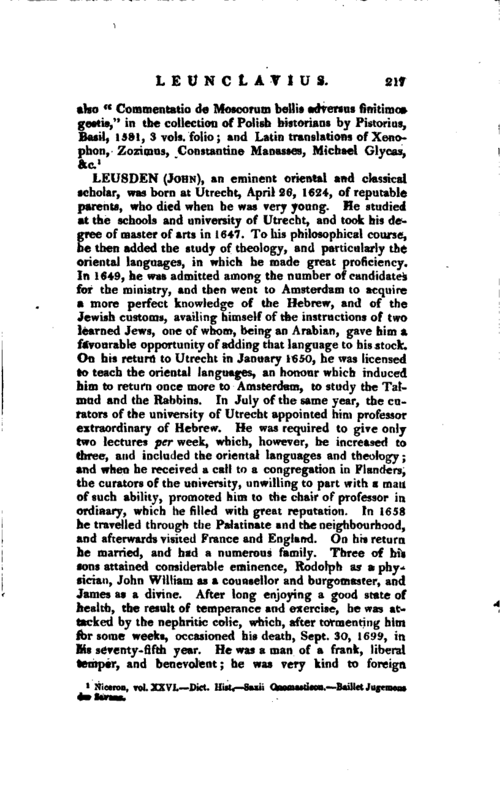 On his return to Utrecht in January 1650, he was licensed to teach the oriental languages, an honour which induced him to return once more to Amsterdam, to study the Talmud and the Rabbins. In July of the same year, the curators of the university of Utrecht appointed him professor extraordinary of Hebrew. 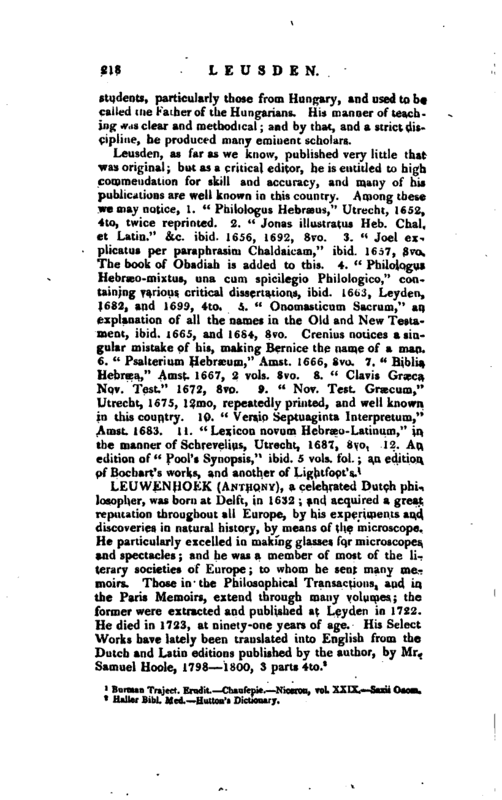 He was required to give only two lectures per week, which, however, he increased to three, and included the oriental languages and theology; and when he received a call to a congregation in Flanders, the curators of the university, unwilling to part with a man of such ability, promoted him to the chair of professor in ordinary, which he filled with great reputation. In 1658 he travelled through the Palatinate and the neighbourhood, and afterwards visited France and England. On his return he married, and had a numerous family. Three of his sons attained considerable eminence, Rodolph as a physician, John William as a counsellor and burgomaster, and James as a divine. After long enjoying a good state of health, the result of temperance and exercise, he was attacked by the nephritic colic, which, afte’r tormenting him for some weeks, occasioned his death, Sept. 30, 1699, in his seventy-fifth year. He was a man of a frank, liberal temper, and benevolent he was very kind to foreign | students, particularly those from Hungary, and used to be called the Father of the Hungarians. His manner of teaching was clear and methodical; and by that, and a strict discipline, he produced many eminent scholars. Barman Traject. Erudit. Chaiifepie. —Niceron, vol XXIX. Sttii On 00ft.